As you create items for you Vendio store, you can set a sale price, start date and end day, but what if you didn’t set these when you created your items and don’t feel like editing all your items? Well, you can use Find and Replace to do those changes in bulk. Let’s suppose you wanted to put all your red sweaters on sale. Just go to My Items, and select the Find and Replace button, Find “red sweaters”, and change the price either by % or dollar amount. You’ll want to find the same items again and set a sale date, and again for sale end date. Find and Replace is a method to replace fields that you used or did not use when you were creating your items so while it does take above three steps to put items on sale, find and replace allows so much flexibility that the possibilities are endless. Below are step by step instructions for putting items on sale and after you do this once, it will be a snap and you’ll be having sales and attracting new business in no time!! by clicking the check-boxes next to them, or use the Find and Replace button to find a specific group of items. i. Defining the exact dollar amount of the sale price. ii. Defining the sale price based on a dollar or percentage amount over or below one of the item’s other prices (Default Item price, Item cost or Store price). iii. Defining the dollar or percentage amount by which to increase or decrease the sale price. 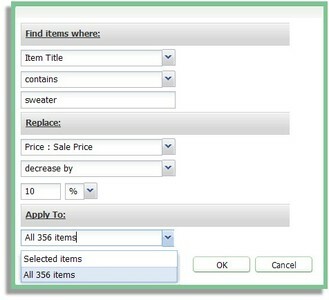 In the below example, we use Find and Replace to locate all items that have the word “sweater” in the title, then set the sale price on all items to be decreased by 10%. a. Re-select the same items: From Items > My Items, select items by clicking the check-boxes next to them, or use the Find and Replace button to find a specific group of items. c. Select the sale Start Date from the calendar. c. Select the Sale End Date from the calendar. This entry was posted on Wednesday, November 4th, 2009 at 12:58 pm	and is filed under Vendio Platform. You can follow any responses to this entry through the RSS 2.0 feed. Both comments and pings are currently closed.